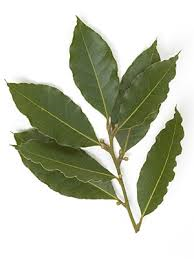 Also known as: Sweet bay, Bay laurel, True laurel, Noble laurel, Roman laurel. A small tree growing up to about 7m although in hotter climates it may reach up to 18m. An evergreen, the leaves are dark glossy green with small yellow flowers followed by black berries. 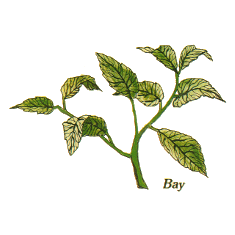 Bay leaves are well known for use in savoury cooking. Oil of Bay may be used for treating sore muscles, sprains and arthritic pains. The leaves are regarded as diaphoretic (inducing perspiration). Also an ametic (inducing vomiting). Bay was used a a symbol of wisdom and glory to the Greeks and Romans hence the placing of laurel leaves on the heads of victorious leaders and atheletes.